Cigar Oasis is the leader in cigar humidification products. Cigar Oasis humidifier was developed in 1997 as the first sealed electronic humidifier for personal humidors. Today, their products have received countless praise for their performance, maintenance-free features, and how easy it is to keep your premium cigars in perfect condition. As makers of the only truly reliable electronic humidifiers and hygrometers, they have earned the reputation of being THE HUMIDIFIER OF CHOICE for premium handmade cigars. 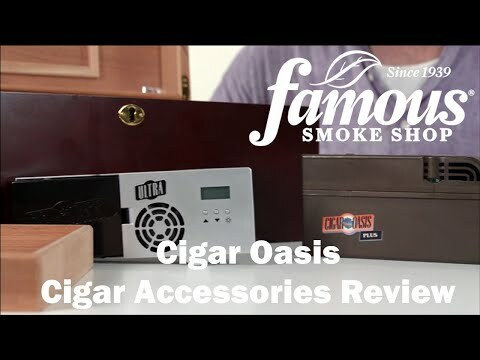 They have expanded their product selection to include the Cigar Oasis Ultra 2.0, which is their most popular, the plus, Magna, Excel 300, and some great accessories to enhance the use and ease of these amazing humidifying devices. So if you are looking for the latest and greatest humidifier for your personal humidor, buy the Cigar Oasis unit that's right for you today. Cigar Oasis 3.0 series of electronic cigar humidification devices! Fully automatic, this line of cigar humidifiers is equipped with Smart Humidor wi-fi on board, giving you complete control over your cigar storage environment - meaning you'll have the ability to monitor and adjust humidity remotely from any iOS or Android device (subscription required after 30-day trial). This is next-gen cigar care - choose the Cigar Oasis that's right for you, now! Nov 8 2018 - Note for iOS users: the Smart Humidor app is expected to launch in theApp Store within the next 7-10 days; Android users may download the Smart Humidor app now in the Google Play store.